Apple Inc. rolled out second-generation AirPods Wednesday, adding hands-free Siri access, 50 percent longer talk time and optional wireless charging to a product that’s key for expanding revenue beyond iPhones. Apple fans have been eagerly awaiting a follow-up to the original AirPods, which were launched in 2016. The wireless headphones have been a hit for Apple, despite being ridiculed in some circles early on for how funny they looked dangling from people’s ears and the perceived potential for them to drop out and get lost. The new version looks and costs the same, at $159, and will be available in stores next week. The latest model adds a new H1 processor that Apple says increases talk time and the ability to summon Apple’s voice assistant simply by saying, “Hey Siri,” without touching the ear buds. Apple said the new chip also lets AirPods connect twice as fast to other devices. 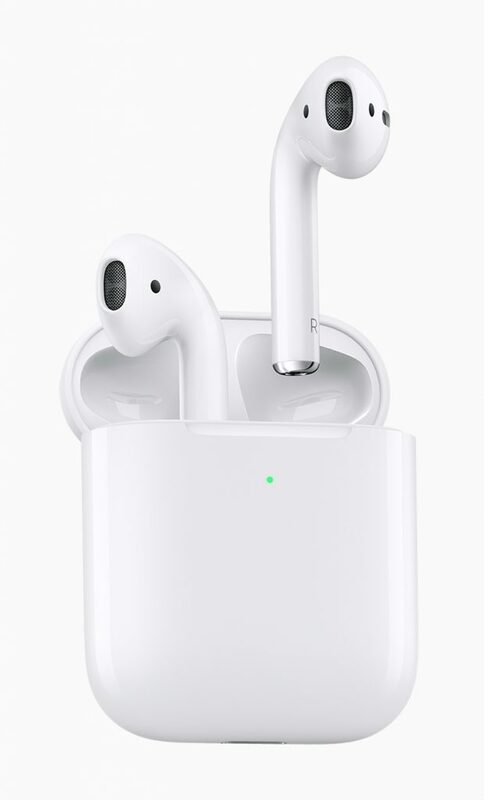 The new model will also be available with a wireless charging case for $199, or consumers who already have AirPods can buy the charging case separately for $79. Apple didn’t mention its AirPower wireless charging pad. The device, delayed since its announcement in 2017, is designed to simultaneously charge AirPods, an iPhone and an Apple Watch. The headphones are a key way for Apple to expand revenue as it sells fewer iPhones. Sales of the smartphone over the holiday quarter were lower than expected. At the company’s shareholder meeting earlier this year, Chief Executive Officer Tim Cook noted that the company is “rolling the dice” on new products and has a “long, great roadmap” of products related to the Apple Watch and AirPods. AirPods are a key component of Apple’s growing Wearables, Home and Accessories segment, which generated more than $17 billion in revenue last year. In the fourth quarter, Apple said revenue from wearables grew 50 percent from a year earlier. The category also includes the Apple Watch and Beats headphones. AirPods seem to have overcome any early skepticism. According to a report earlier this month by Counterpoint Research, Apple sold about 35 million pairs in 2018, accounting for almost three-fourths of the market for wireless earphones. Apple doesn’t break out revenue for the device. The original AirPods faced significant supply shortages for months after their initial launch, but Apple seems to be correcting that this time around. As of Wednesday, it’s quoting ship dates for the end of March, suggesting a better supply and demand balance for the new model. Bloomberg reported last year that Apple was working on an AirPod upgrade. The Cupertino, California-based company is also working on a future version that will be water resistant and feature noise-canceling functionality. Also in the product pipeline: high-end, over-ear headphones that would compete with Bose Corp. and Apple’s own Beats brand. The new AirPods mark the third product launch of the week for Apple. On Monday it debuted new iPads and on Tuesday a faster iMac. Apple on Wednesday also announced new colors for its Apple Watch bands and a pink version of its iPhone battery case. The company is rolling out the new products now so it can put the focus on the expected launch of video streaming and magazine subscription services at a media event on March 25. Apple shares were little changed at $187.57 at 2:01 p.m. in New York.